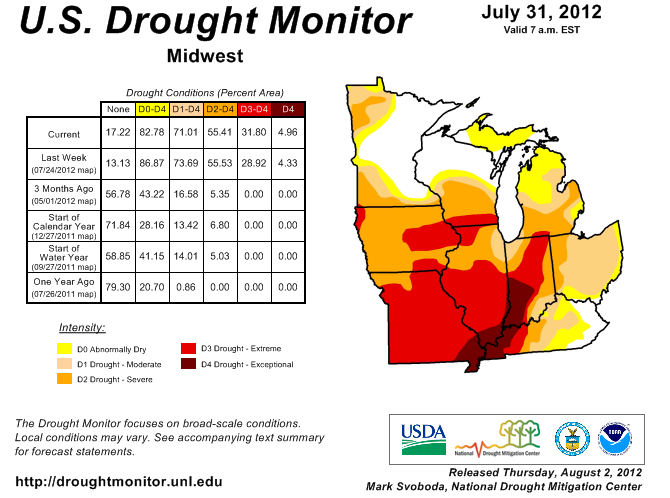 According to state climatologist of Iowa, the current drought surpasses that of 1988. The economic impacts are likely to be less severe to farm economies this time around because of a higher rate of crop insurance and the recent high prices for farm commodities. A further downside is that the hot and dry weather that has brought these conditions is expected to last through September. It will be a miracle if a lot of perennials are strong enough to make it through the winter. The corn crop is pretty much fried and now it looks like soybeans are next. On August 10th the USDA will update its crop estimate and no one is thinking that the data will look good. Considering half of the counties in the U.S. are under a disaster declaration because of the drought, how could it be? One upshot, with little rain this summer farmers have applied a lot less fertilizer to their fields which means that there has been little runoff into rivers. Due to the drought affecting the Mississippi River’s watershed this means that the predicted dead zone in the Gulf of Mexico will be smaller this year. Gotta’ look on the bright side, right?